At this show on Saturday night more than 13,000 heavy metal fans packed the AT&T Center as the legendary British rock pioneers brought their Book of Souls Tour to San Antonio, Texas. The tour was set to be epic after the success of the band’s 16th studio album, which reached the number one metal album of 2015 by Loudwire and number 5 by Rolling Stone. Though relatively few cell phones waved in the crowd, it was probably only due to the age of the fans—many of whom probably grew up listening to the band. “How many of you were born after 1982,” Dickinson asked the crowd during the show. About half the crowd answered in yells, indicating that Iron Maiden, a band for 40 years, can still influence a younger crowd who were raised on heavy metal music their parents listened to. Despite the predominance of older people in attendance, this didn’t detract from the energy of the crowd, especially in the general admission floor, where the younger crowd reigned supreme and ultimately started a mosh pit upon a performance of “The Trooper” from Iron Maiden’s 1983 album Piece of Mind. Perhaps one of the more interesting moments of the show was when Dickinson came out on stage waving a Union Flag emblazoned with Iron Maiden’s skeletal mascot Eddie, who made a physical appearance later on in the show dressed as a Mayan warrior standing over 12 feet tall. 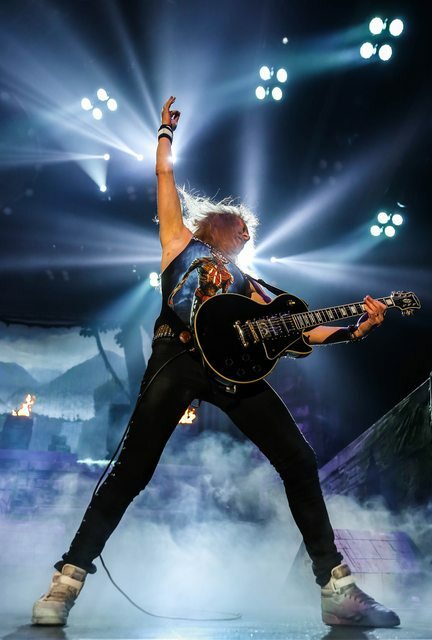 Guitarist Janick Gers ran in and out between the legs of Eddie as part of their comedy skit. Eddie then made his way to Dickinson, who—moments later—ripped out the heart of the mascot and showed it off to the crowd as flamethrowers blazed off the stage. This interaction between Dickinson and Eddie was the preeminent moment of the night and an unforgettable memory for the fans. Near the end of the show, a more heart-warming moment came when Dickinson was amazed at the number of people from different backgrounds that were all under one roof enjoying music together. After this acknowledgement, the crowd cheered in triumph. Several fans held up their country flags customized with Eddie’s or Iron Maiden's name on them. As the show was in San Antonio, a city with a population that’s over 50 percent hispanic, it came as no surprise that even louder applause was heard at Dickinson’s mention of Mexico. “Tonight we can prove that we can all come together and have a great time,” Dickinson said. This speech led into “Blood Brothers,” from their 2000 album Brave New World, a song that discusses the human struggle of continually fighting over land, money and self-gain. The prevailing feeling at the end of the song was a need to reconcile and come together as blood brothers, in spite of nationality or race. Iron Maiden ultimately ended their set with the classic song, “Wasted Years.” Although there were a number of older hits strewn throughout the performance, the band played six songs from The Book of Souls in honor of their tour. Admittedly, this came at the expense of performances of some of their most popular songs such as “Run to the Hills,” and “Hallowed Be Thy Name,” which would have made the show even better than it was. Ultimately, for a band that is in the 60-age range, Iron Maiden’s astounding performance showed they can still perform at the high energy level they’ve been famous for since the beginning of their career.